Milnerton is situated approximately 11km from Cape Town’s city centre and is blessed with spectacular views over the bay towards Table Mountain. Perched on the edge of the Atlantic Ocean, it is well known for its stunning properties, spectacularly scenic lagoon, and its close proximity to many of Cape Town’s hotspots. Milnerton is the oldest of the suburbs along the northern Table Bay. Milnerton was founded in 1897 on the site of the old farm, Janbiesjeskraal, and named after High Commissioner, Lord Alfred Milner. After a rather slow start, the area began to grow steadily after the arrival of the railway in the early years of the 20th Century. Today, Milnerton is one of the fastest growing areas in the Western Cape. The stretch of coastline from Green Point to Milnerton has seen more than 150 shipwrecks, which is more ships than any other coastline in South Africa. Milnerton boasts many stunning homes and is becoming a popular place to move to. Properties in this town range from approximately R1 million to R6 million +. The average price of property is around R1.5 million. The majority of buyers in this area are between the ages of 36 and 49, making it a great place for growing families. One of the most identifiable features of Milnerton is its lagoon, formed where the Diep River enters the sea, with palm trees adorning the lagoon banks. The lagoon is a hotspot for all canoeists who get the best of both worlds: a gorgeous view and a spectacular canoeing adventure. Zonnekus (Dutch for sunny coast) is a beautiful Dutch home which was the first house built on Woodbridge Island in 1929. It was built by Sir David Graaf and used by his family as a seaside home until his death in 1931. 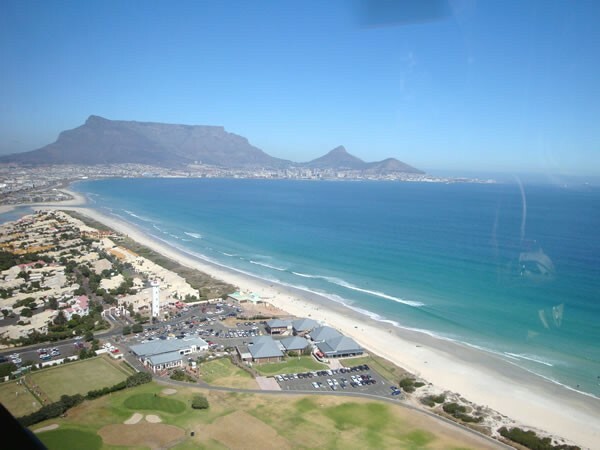 Milnerton's beach is well known for its spectacular postcard views of Table Mountain and is a popular surfing spot. The water is generally cold as a result of the Benguela current that flows along Africa's western shore, so make sure you pack your wetsuit! When the wind isn't blowing, the beach is great for walks and taking in the scenery. Every Wednesday during summer the surf ski and stand up paddlers use the southeasterly winds and race the Downwind Dash series to Big Bay beach. Before going to the beach, have a look at the Milnerton Lighthouse – a 21-metre high cylindrical tower painted white. It boasts a revolving electric optic producing 800 000 candela and was completed on the 10th March 1960. Situated on the dunes at the edge of the Atlantic Ocean next to the lighthouse at Milnerton Beach, you’ll find Maestro's on the Beach. The restaurant boasts 180° unsurpassed views of Cape Town, Table Mountain, Robben Island and all the way up the West Coast to Blouberg. The deck area is very popular as one gets the feeling of being on the deck of a cruise ship as the waves of the Atlantic Ocean literally break at your feet. Less than 10km out of Milnerton, you’ll find The South African Air Force (SAAF) Museum. Based at the Ysterplaat Air Force Base, this is the second largest military aviation museum in South Africa. The Museum houses a varied collection of exhibits covering the full period of the SAAF's existence and its operational activities as well military and civil aviation in the Cape. In addition to aircraft, weapons, engines & uniforms there is a small display of Royal Flying Corps memorabilia. A stone’s throw away from Lagoon Beach, you’ll find the Milnerton Market. Established over two decades ago, this lively open-air trading space, which occupies land equal to four football fields in size with a breathtaking backdrop of Table Mountain, is not only one of the city’s largest, oldest and most iconic informal fairs, but a must visit for deal seekers. The Paddocks Shopping Centre is a conveniently located shopping centre that caters to the Milnerton community. With over 40 stores, the centre offers a unique everyday shopping experience. Situated right on the Bus Rapid transport route on the West Coast Road, the centre offers easy access to all. If you’re looking for decent schools, Milnerton has it all. Milnerton High School is a family made up of teachers and learners who enjoy the challenges and rewards of a quality, well-rounded education. Their broad base of activities (both curricular and extracurricular) reflect their diversity and provide opportunities for learners to find their niche and excel. Seamount Primary School is a proud family school committed to providing quality education by developing confident, balanced individuals in a well-resourced and nurturing environment. Their aim is to promote the building of character, diversity and creativity, enabling each individual to contribute to their communities in meaningful and positive ways. Capriccio! Arts Powered Pre-school is a Montessori inspired preschool, focused on following the individual child, and recognising their ability to direct their own learning in a carefully prepared learning environment. They are passionate about the power of art education in all its forms, namely music, dance, drama and visual art. If you’re looking for a trusted healthcare professional, then visit Mediclinic Milnerton. The hospital offers patients a broad spectrum of professional medical services, including; professional consultations, quality medical care and well-equipped operating theatres, and continually strives to improve on its well-established reputation for affordable, specialised, professional healthcare in an environment of caring commitment. If you’re looking for a place to call home, Milnerton is a great choice. Get in touch with us and we’ll find the perfect property for you and your family.